Description - Our Dance Tile Deluxe tiles are varnished with a durable high-gloss finish designed to resist scuffs and scratches. These real wood dance tiles are offered in two elegant color options to stand out at your prestigious event. These modular real wood dance floor tiles are designed specifically for a quick and easy installation taking advantage of their tool free interlocking system. Our dance floor tiles are water resistant allowing them to be used for indoor or outdoor events and they can be cleaned with any standard urethane floor care product. 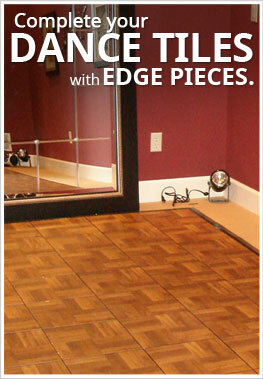 When your looking for the best modular real wood dance floor tiles on the market these tiles will not disappoint you. Material - Real wood oak parquet top inset into a high impact polypropylene base. Recommended Uses - Our Dance Tile Deluxe flooring is perfect for indoor or outdoor weddings, school dances, dance competitions, catering events, high-end trade show booths, formal events, and multiple other special events where an elegant real wood dance floor is desired. Vacuuming or sweeping any loose crumbs, dust, or debris from the dance tiles when necessary. Damp mop the dance tiles for light spills. If you have some tough stains to remove you can use any standard urethane floor care product. When installing the dance tiles, we recommend starting in the front left corner of the room and working your way out from there. Made with real wood inserts that come in 2 elegant oak parquet color choices. Beautiful high-gloss urethane finish to protect against scuffs and scratches. Simple and durable interlocking system allows you to complete any Dance Floor quickly and easily. I love the quality of these tiles. They're great for my girls to practice on and there doesn't seem to be a ton of wear and tear. I was very impressed with this product. We purchased a 4x6 set of tiles, with edges. The floor is real wood, very well constructed, very simple to put together and is perfect. My daughter is a tap dancer and uses this for practice at home. Product is exactly as described and arrived earlier than promised. I would highly recommend for dancers.